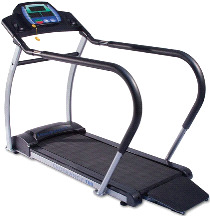 Body Solid T50 Endurance Cardio Walking Treadmill w/ Adjustable Speed. Featuring full length thick hand rails for both safety and support, a high torque 1.25 HP motor, and a max user weight of 310 lbs. Any user will find the T50 easy to access with its belt wide rear entry ramp and 17.75” x 51” orthopedic walking belt. The high torque motor has been tuned to meet the needs of today’s seniors and is capable of moving a load from 0.1 mph to 5 mph in 0.1 mph increments. We back every Fitnex product that we sell with our 100% money back guarantee. If you have any questions please call us at (701)223-9936 or Toll Free (800)355-2956. While most other ‘walking’ treadmills feature ¼ to ½ length hand rails, the T50 goes the extra mile with full length hand rails. Each rail is fully padded and is a full 2 inches thick thus adding an extra level of comfort. Another limiting factor for most treadmills in this market is the size of the LED Display. Again Endurance Cardio has answered the call with 3 Jumbo 1 ¾” big blue LED displays devoted to Time / Distance, Speed, and Heart Rate / Calories. All interface buttons are oversized and easy to use. At a time when the prevailing thought in treadmill design is more is better, Best Fitness has truly listened to its customers and taken out the confusion and waste of too many frills and needless programs, and come up with a simple yet functional treadmill that simply gets the job done. - Adjustable Speed from 1-5 mph.